Now that Israel Week Fall 2017 at the University of Illinois has concluded, I look back and reflect on the true purpose of this event. Under the theme of “Spreading Love,” we showed the strength of our united Jewish and pro-Israel communities as we celebrated our heritage. 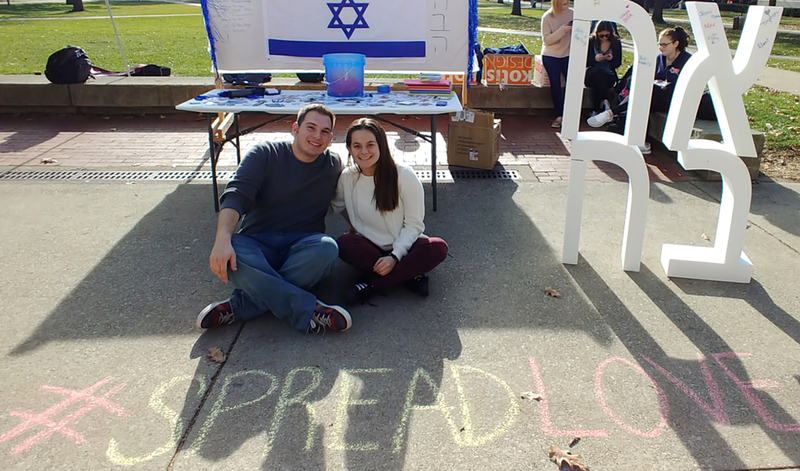 On the main quad, we tabled from Monday to Thursday spreading positive messages to the student body, signing giant letters spelling “LOVE” in Hebrew, and distributing free Israeli flags. Through the sale of Israel t-shirts, over $500 was raised for Save a Child’s Heart, a charity which provides free cardiovascular surgeries to children from developing countries. We learned about Sigd, an Ethiopian Jewish or Beta Israel holiday, and heard from Waga Brok share her family’s story of leaving Ethiopia by foot for Israel. An event called “People to People” highlighted Israel’s international humanitarian efforts while enjoying colorful cupcakes decorated with an assortment of national flags. Shuk Night was a delicious celebration of Israeli culture and cuisine and a chance to schmooze with friends. Tel Aviv Bar Crawl had an enormous turn out and together we danced the night away at local campus establishments. Finally, we all enjoyed a delicious meal, filled with the warmth of community, at Israel Shabbat. Dozens of leaders from Hillel, Chabad, IlliniPAC, and Illini Students Supporting Israel gave their time and energy to make this week such a success. So, what was the real meaning behind Israel Week? For me, it was to raise the voices of the Jewish and pro-Israel students who call this campus home. To say that we are here, we are strong, and we are proud of who we are. This semester, our communities faced numerous attempts to scare us, to intimidate us, and to have us question our faith. Anti-Semitism reared its ugly head in the form of vandalism of religious sites, hate speech and threats, and even the burning of an Israeli flag. Our response to these attacks must be to love each other more, and to be louder and prouder in celebrating our identities. This is what we do during Israel Week. This is why we have Israel Week every semester. When we stand together and wave our flag – literally and symbolically – across campus, we are saying that we are not afraid and we are not going anywhere. I cannot wait for Spring 2018 to do it all again.